Whatever happened to PC soundcards? Are soundcards becoming a component you can live without or is there more going on? Where did all the soundcards go? When I was a lad, it was all soundcards 'round here. Now a trip to your local PC emporium's a very different experience. You'll find a handful of cards pitched at pro-gamers, a couple of USB interface devices and lots of speakers. Speakers and headphones. Aisles of them stretching as far as the eye can see, like that bit in The Matrix. Okay – we exaggerate – but only a bit. The PC audio industry has turned topsy-turvy. Where once the soundcard was an essential component in every system, it now seems like an afterthought – if it's included at all. Check out a cross section of ready built systems aimed at Joe Public; like Dell's Studio XPS range. They're high performance desktop PCs aimed at power users, shipping with Windows 7 Ultimate and up to 16GB of dual channel memory, but with integrated audio by default. Or there's the Mesh's Matrix Pro PII 955, it's great for gaming with 8GB of memory and 512MB ATI Radeon graphics but with 7.1 audio built into the Asus multimedia motherboard. Where did the soundcard go? The ability to upgrade PC hardware has long been one of the platform's most appealing aspects. Memory and storage can be slotted in at will. Even CPU upgrades are no longer the rocket science they once were. So what's happened to the soundcard? When did they become so scarce and why? We already had some ideas of our own. The switch from XP to Vista then Windows 7 seemed to play its part. Integrated audio is looking pretty good these days, too. To confirm our speculation, we spoke to a panel of industry experts; bigwigs in the world of PC audio production. They paint a picture of an industry that's very far from being sent to the knackers' yard. In fact, it's looking healthier than ever. For some, the shift in attitude towards PC audio can be traced back to the release of Windows Vista and DirectX 10 in 2006. In the previous versions, DirectSound: the API layer between the software on your machine and your soundcard directly communicated with the hardware through its drivers. In Vista, this functionality was radically altered so that DirectSound ran in emulation mode instead, as a software process. The immediate result was that apps requiring hardware acceleration took a performance hit. Games with DirectSound3D sound went silent, DVD soundtracks didn't play back properly, mixing was glitchy and effects were dry. Reading through messages left on gaming boards revealed much more than leet speak and bad punctuation. There was a lot of frustration, not only with Microsoft, but with soundcard manufacturers for a response to the issue that was perceived as slow. Considering that the Universal Audio Architecture deployed in DirectX 10 had been around on paper since 2002 – and had even been implemented previously in the 2004 release of Windows 2000 SP4 – that frustration may have had some foundation. Three years down the line, what's the state of play? Microsoft hasn't budged on the issue. It's following a decade long plan to help standardise audio hardware support, after all. Windows 7 and DirectX 11 still emulate DirectSound in software. But, audio component developers have caught up and, more significantly, have even made strides to correct legacy game behaviour on Vista and Windows 7. "When we transitioned from XP to Vista, we came up with a utility called Creative ALchemy that intercepted DirectSound calls and rerouted them to OpenAL APIs, which has direct access to the hardware," says Steve Erickson, VP of Audio at Creative Labs, "That solution is still relevant for Windows 7. We provided that as a free service to anyone who owns our (legacy) products, so that they would have a good experience going forward". Some manufacturers even say that the change that began with Vista has been a good thing for the industry. 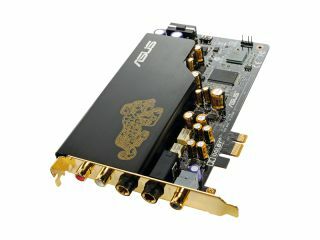 Asus make discrete soundcards and motherboards with integrated audio, so are well placed to survey the market from the top and the bottom. "In Vista and Win7 - everyone's at the same starting point," says Asus spokesperson, Iain Bristow, "Even in XP, the CPU resource required by audio is so little that the difference isn't noticeable". Referring to benchmarks that show little difference in response time between hardware accelerated systems and CPU reliant audio, Bristow says it makes little sense for gamers to chase nanoseconds of latency. "The key to great gaming experience is sound quality, which Asus provides consistently throughout all of our sound products". Altec Lansing is well known for its speaker solutions. Adrian Bedggood, who oversees PC audio for the company in Europe is in agreement with his competitors at Asus: "Windows Vista did make significant changes to the handling of audio within Windows OS. Over the long course, this will allow more integration of software with the sound system allowing new features and convenient function". "Integrated audio is a reality. It's been like that for over 10 years now," says Steve Erickson. Rather than seeing it as a threat to the soundcard, the Creative Labs VP thinks that integrated audio is just another segment of the market. "If I'm going to play a first person shooter, I'm probably going to use a discrete soundcard, because the graphics load is still very high, to get a good game experience". "We also deal directly with PC OEM producers like Acer, Asus, MSI. We provide them with the software stack that goes on their motherboards to give them functionality that's similar to our high-end soundcards, but that runs in software. From a consumer perspective it's good no matter what they have; it just depends on what their desire is". Predictably, developers who have more of an invested interest in onboard audio are a little more bullish. IDT (Integrated Device Technology) make PC audio chips with up to 10 audio channels, with Windows Logo Program certification. "Even for demanding gamers, the integrated audio on modern PCs is normally more than adequate," says Pietro Polidori, an IDT Vice President overseeing Europe, the Middle East and African markets, "The IDT High Definition Audio products are developed specifically for major PC manufacturers, who then integrate them onto their motherboards. It's hard to understand the need for a separate soundcard for any mainstream app". Current page: Where did all the soundcards go?